Go for the Gear! For a great selection of hunting, fishing and camping supplies visit Poacherâ&#x20AC;&#x2122;s Corner in Glendon (see ad page 56). For all of your paddling needs visit Up The Creek Kayaks & Canoes in Bonnyville (see ad page 59). Elk Island National Park - Rent canoes, SUPs, and kayaks. See page 23. Hamilton House Bed & Breakfast - Rents canoes on a private lake near Cold Lake. See ad page 60. L&D Marine Rentals - Rents sea-doos, kayaks, pontoon and fishing boats on Moose Lake, Bonnyville. See ad page 59. Sir Winston Churchill Provincial Park - Rents canoes, kayaks and SUPs. See ad page 49. 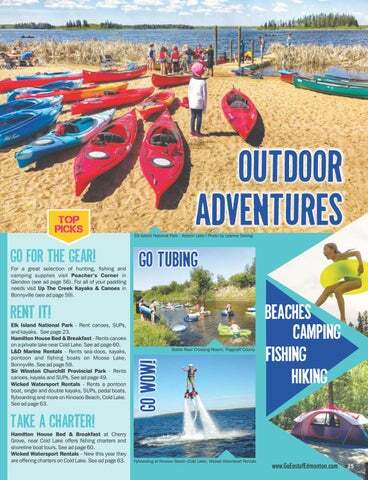 Wicked Watersport Rentals - Rents a pontoon boat, single and double kayaks, SUPs, pedal boats, flyboarding and more on Kinosoo Beach, Cold Lake. See ad page 63. Take a Charter! Hamilton House Bed & Breakfast at Cherry Grove, near Cold Lake offers fishing charters and shoreline boat tours. See ad page 60. Wicked Watersport Rentals - New this year they are offering charters on Cold Lake. See ad page 63.